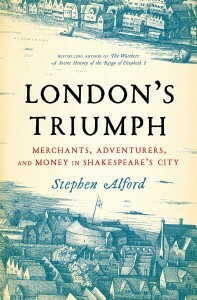 “The Elizabethan and Jacobean mind was brilliantly elastic.” “Thinking a project achievable somehow made it so.” In London’s Triumph, Stephen Alford succinctly captures the expanding worldview of an insular nation that grew from being a mere player on the world stage into an international power. For nearly the entirety of the sixteenth century, a plethora of events converged to open the world to England during the age of the Tudors. The pursuit of God, Gold, and Glory (numerous studies follow this trail) was fueled by increasing wealth, advancements in shipbuilding, and a merchant class growing in size and significance. From 1500 to about 1620, London’s population quadrupled; the publishing industry exploded and market stalls filled with pamphlets and books that extolled the virtues of exploration; mercantile trade expanded from the nearby continents to new fields in Russia and Japan and, obviously, colonies in the New World. England moved from a “marginal backwater” to a growing international power. Alford does not focus here on the major characters known to all. Rather, he has “given much more space to characters who otherwise lurk too much in the shadows of the familiar.” These “shadows” include Richard Hakluyt. His work The Principal Navigations “is one of the glories of English prose” but is probably now known only to history and literature majors. Anthony Jenkinson and Sir Thomas Smythe were just two of many extraordinary merchants who built an economic bridge around the world. Thousands of citizens insignificant to traditional history walked the streets of London or filled the counting houses and kept the complex weave of economic power growing. London’s Triumph shows that the city was “a place of formidable dynamism” in the sixteenth and seventeenth centuries. The “moral limits of money and fortune” were tested as “usury became interest, and investors put their money into ventures that pushed minds, men and ships to their limits….” “London was a city where merchants were driven to buy and sell for money.” Alford’s study is possible because of the immense volume of personal, financial, legal, and governmental records that exist, enabling him to reveal the network of merchants, explorers, and publishers that shaped a new London. Alford has created a triumph of scholarship which is meticulously researched and beautifully written. It will appeal to the general reader who has an interest in this period of history. It is also an important resource to scholars in history and literature for it provides the reader a wealth of background information that informs the actions of political leaders and the writings of the giants of the time. When I went off to college, I looked up the master’s thesis of my incredible high school English Literature teacher. I was surprised and somewhat disappointed that her degree was in history! However, as I studied more literature I came to understand the logic of why historical context was so vital to understanding the depth and breadth of literary works. This volume underscores that knowledge. 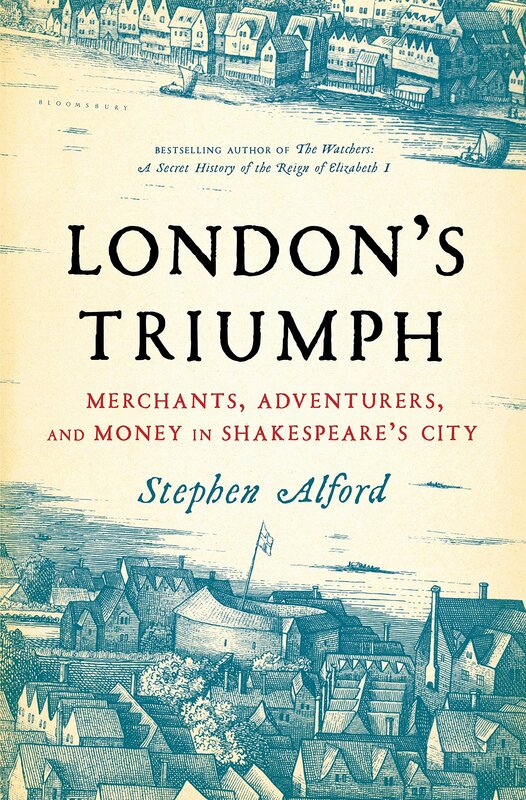 London’s Triumph makes a nice companion volume to Alford’s The Watchers. Previously a senior lecturer in history at Cambridge University, he is now professor of early modern British history at the University of Leeds.